Download "RF RADIATED EMISSIONS MEASUREMENT SYSTEMS TUTORIAL"
1 RF RADIATED EMISSIONS MEASUREMENT SYSTEMS TUTORIAL INTRODUCTION Measuring radiated electromagnetic emissions first requires a measurement system. A basic measurement system usually contains a minimum of an antenna and a receiver. To measure very small signal levels may require the addition of a pre-amplifier to the receiver system. Figure 1 shows a typical receiver system block diagram including a pre-amplifier. Figure 1 will be used for the following discussion. FIGURE 1. RECEIVER SYSTEM BLOCK DIAGRAM It is beyond the scope of this text to address in detail such measurement errors as receiver detection mode errors, radio frequency pre-selection (RF) filtering, or tuner overload errors. Peak detection of continuous waves (CW) will mainly be discussed. There are many terms currently used to define radiated electromagnetic energy. Some common terms used are non-ionizing radiation (NIR), electromagnetic fields (EMFs), radiated emissions, and broadcast signals. In this paper, "emissions" will be used to describe radiated electromagnetic energy. 2 Electromagnetic measurement systems are used to measure power densities, or power spectral densities, of electromagnetic fields at a point in space. Power density is defined as the "power per unit area normal to the direction of propagation usually expressed in units of Watts per square meter W/m 2 ), or for convenience in units such as milliwatts per square meter (mw/m 2 ), or even in microwatts per square centimeter (µw/cm 2 )." Plane-waves, power densities, electric field strengths (E), and magnetic field strengths (H) are related by free space loss, i.e., 377 ohms (Ω ). Electric field strengths and magnetic field strengths are expressed in units of Volts per meter (V/m) and Amperes per meter (A/m), respectively. Field strength is therefore defined as: E = Square Root (120πP) E = rms value of field strength in Volts/meter P = power density in watt/meter = impedance of free space in ohms Power density (P D ) is related to the electric field strength (E) and the magnetic field strength (H) as: P D = E 2 2 (far field) /377Ω = 377ΩH Again, the rate at which electromagnetic energy (power) is propagated by a wave - - power density -- is usually specified in Watts per square meter (W/m 2 ). The power density equation is: P D = P T /4πr 2 P D = power density in watts/meter 2 P T = transmitted power in Watts r = distance in meters Radiated electromagnetic fields -- radiated emissions -- are produced from many sources. Sources of electromagnetic energy range from manmade sources such as commercial broadcast stations and automobile ignition systems to natural sources such as galactic noise and lightning. To further complicate matters, these emissions can drastically differ in frequencies and in their magnitudes. Because of the potential wide range of measurement requirements special measurement systems are sometimes necessary. These systems must be well-planned or inaccurate measurements may result. Important design specifications should include system selectivity and system sensitivity. These terms will be defined and demonstrated in the following sections. 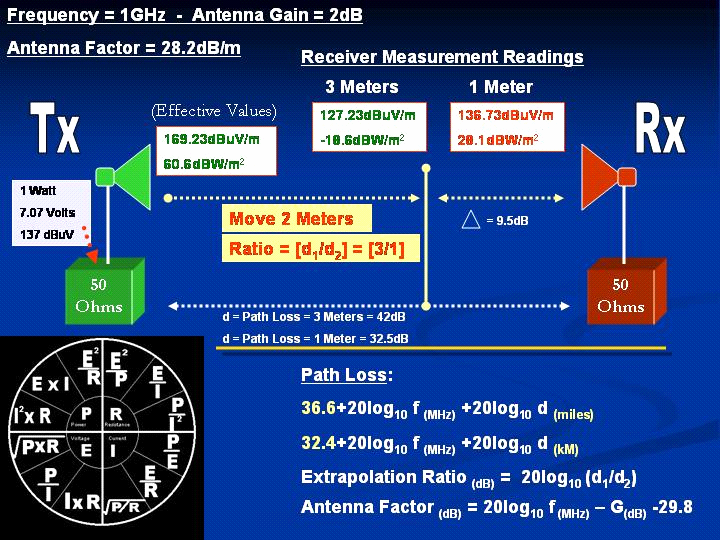 4 The power received by the antenna is then defined by: P r = PA e = PGλ 2 /4π (Watts) P = power density in Watts/meter 2 G = antenna (power) gain λ = wavelength in meters also, Combining these equations with the field strength equation yields: then, Knowing that: since an antenna factor is defined as: P r = E 2 Gλ 2 /480π 2 P r = V r 2 /Z o V r = received voltage Z o = receiver input impedance V r 2 /Z o = E 2 Gλ 2 /480π 2 λ = 300 meters/second/f (MHz) E = (V r fπ/50ω)(square Root (30/Z o G)) we can simplify and rearrange terms to yield: K = E/V r then, K = (fπ/50ω)(square Root(30/Z o G)) or in logarithmic form [for Z o = 50 Ω (ohm) system]: K = 20log 10 f MHz -G db (db) THE RECEIVER AND AMPLIFIER A receiver is an electro-mechanical device that receives electromagnetic energy captured by the antenna and then processes (extracts) the information, or data, contained in the "signal." 5 The basic function of all receivers is the same regardless of their specific design intentions, broadcast radio receivers receive and reproduce commercial broadcast programming, and likewise, TV receivers detect and reproduce commercial television broadcasting programming. Special, or unique, receivers are sometimes needed to detect and measure all types of radiated, or transmitted, electromagnetic emissions. These specialized receivers may be called tuned receivers, field intensity meters (FIMs), or spectrum analyzers. Radiated emissions that receiver systems may be required to measure can be generated from intentional radiators or unintentional radiators. The information contained in intentionally radiated signals may contain analog information, such as audio, or they may contain digital data, such as radio navigation beacon transmissions. Television transmissions, for example, contain both analog and digital information. This information is placed in the transmitted emission, called the "carrier," by a process called "modulation." Again, there are many different types of modulation, the most common being amplitude modulation (AM) and frequency modulation (FM). Receivers detect, or extract, the information/data from radiated emissions by a process called "demodulation", the reverse of modulation. Many radiated emissions requiring measurements do not contain any useful information or data at all. As an example, radiated emissions from unintentional radiators, such as computer systems, are essentially undesired byproducts of electronic systems and serve no desired or useful purpose. These undesired emissions can, however, cause interference to communications system, and if strong enough, they can cause interference to other unintentional radiating devices. Radiated signals (if strong enough) can also present possible health hazards to humans and animals. Because these emissions must be measured to determine any potential interference problems or health hazard risks, specialized receiver systems must be used. An important parameter for any receiver is its noise figure, or noise factor. This parameter will basically define the sensitivity that can be achieved with a particular receiver. An amplifier, usually called a pre-amplifier, is sometimes required when attempting to measure very small signals or emission levels. Because these devices amplify signals, they will also amplify ambient electromagnetic noise. If improperly used, amplifiers can detract from the overall system's sensitivity as well as possibly causing overloading to the receiver's tuner input stage. Overloading a tuner's input stage is simply supplying a larger signal amplitude than the receiver's tuner input circuitry is capable of handling, thus, saturating the tuner's input stage. Just as with the receiver, it is important to know what the noise figure, or noise factor, of the selected amplifier is when designing or specifying a measurement system containing a pre-amplifier. 6 The noise figure (N fig ) for a device (receiver or amplifier) is defined as: N fig =10log 10 N o -10log 10 G d -(-174 db+10log 10 B r ) N o = measured noise in milliwatts G d = device power gain - linear ratio B R = receiver bandwidth in Hz The use of these parameters for designing or specifying measurement systems will be explained and demonstrated in the following section. SPECIFYING OR DESIGNING RADIATED MEASUREMENT SYSTEMS When specifying or designing any measurement receiver system, one should consider that the "system" will include other devices such as antennas, amplifiers, cabling, and possibly filters. Because a receiver's selectivity, the ability to select frequencies or frequency bands, is primarily a function of the receiver's tuner design, and will be chiefly dependent on the individual receiver selection, selectivity will not be specifically addressed in this text. Receiver system sensitivity, however, presents one of the greatest difficulties, or challenges, when designing or specifying receiver measurement systems. Therefore, the sensitivity of the two basic types of receiver systems, one with a pre-amplifier and one without a pre-amplifier, will be addressed in some detail. Because antennas are not perfect devices and have associated "losses," the following examples will include explanations for these error corrections. As mentioned previously, amplifiers will not only amplify the emissions being measured but they will also amplify ambient electromagnetic noise. These ambient conditions can drastically change the overall sensitivity of a measurement system. Another potential problem associated with using amplifiers is that they also generate internal electromagnetic noise. Being active devices they will introduce their own internal electromagnetic noise into the receiver system, again having an influence on the total system's noise level, thus, its sensitivity. Some corrections for the above mentioned problems are necessary to accurately calculate both the receiver's signal input sensitivity and (more importantly) the total system's ambient sensitivity. Without knowing the total measurement system's ambient sensitivity, measurements may not be possible down to anticipated emission levels. In electromagnetic measurement systems terms such as ambient sensitivity, system sensitivity, and receiver sensitivity have been used interchangeably. More confusing expressions commonly used are terms such as "receiver noise floor," or "system noise floor." 12 Finally, using equation S e = N fig -174+B r -A e, we can calculate the total system sensitivity. The system sensitivity (power density) will be: S e = (-17.5)= dbm/m 2 Now that the system sensitivity (S e ) is known, defined in power density units (dbm/m 2 ), it may be more useful to convert further to more commonly used units such as field strengths. Again, the units of measurement for field strengths are Volts per meter (V/m), or for convenience dbµv/m (decibel ratio of V/m referenced to 1 microvolt). For ease in understanding, and for simplicity in calculating, it is recommended that unit changes be done by first converting power densities (dbm/m 2 ) to milliwatts per square centimeter (mw/cm 2 ), then converting to field strength units such as V/m or dbµv/m. In converting power densities to field strengths the following conversion factors will be helpful: 1. Units/cm 2 (square centimeters) = units/m 2-40 db 2. Volts/meter (V/m) = Square Root (mw/cm 2 x Ω) Using the above conversion factors (1 and 2), the equivalent field strength sensitivity would be: dbm/m 2 = dbm/cm dbm/cm 2 = 10 (-152.7dBm/10) = 5.4 x mw/cm 2 3. Square Root (5.4 x mw/cm 2 x Ω) = 1.4 x 10-6 V/m 4. 20log x 10-6 V/m = 2.9dBµV/m Some additional helpful conversion factors for radiated measurement units are: dbw/m 2 = dbv/m-25.8 dbw/m 2 = dbµv/m dbm/m 2 = dbµv/m dbm/cm 2 = dbµv/m dbm/cm 2 = dbv/m-35.8 dbw/m 2 = dbm/m dbw/m 2 = dbw/cm dbw/m 2 = dbm/cm The measurement system's sensitivity has now been calculated and defined. It is important to note, however, that the system may not be capable of measuring all ambient signal levels down to this level. As mentioned earlier, ambient noise levels may be higher than the measurement system sensitivity. This will result in the ambient noise levels masking potential measurements down to these levels. These potential problems can be resolved with proper system pre-selection (RF input filtering) and receiver I-F bandwidth adjustments. 13 SUMMARY In summary, designing or specifying receiver systems requires that each system be designed or specified for its particular application. Two important design parameters that must be addressed are the system's selectivity and its sensitivity. This can become demanding because measurement systems may be required to detect and measure radiated emissions comprised of narrow-band and/or wide-band signals, they may also be required to measure radiated signal strengths varying from very small to very large amplitude levels. Selectivity, the ability to tune (select) to a frequency or a band of frequencies, is primarily dependent on the particular tuner (receiver) selection in addition to any radio frequency (RF) input filtering, called pre-selection. By filtering undesired input RF emissions, and with proper receiver intermediate-frequency (I-F) filter adjustments, it is possible to measure very low emission amplitudes present in frequency bands containing much higher amplitude emissions or noise levels. These filter selections will be based on the emission types being measured and on the ambient conditions under which the measurements are made. Sensitivity, the lowest rf amplitude levels that a receiver system will be capable of measuring, is dependent on several variables. These variables are involved with specific antenna selections, receiver noise figures/factors, pre-amplifier gains and noise figures/factors (if used), and the system's filtering and cabling. If not properly planned, all these devices can detract from the overall system's performance. The first step in designing or specifying a measurement system is to understand the actual measurement requirements. This should include the emission frequencies, their bandwidth's, and probable emission amplitude levels. This information will determine any required RF and I-F filtering and, in particular, the overall system's sensitivity needs. The second step should be to calculate the total system parameters to include all the devices selected to be used in the measurement system. Any pre-selection required can usually be accomplished using passive high-pass, low-pass, or band-pass filters. These types of filters can greatly assist in removing any undesired ambient noise or signals removed from the intended measurement frequency or frequency band of interest. The RF filtering will primarily determine the "carrier-to-noise ratio" of the system. RF filtering will also prevent possible overloading to the system's pre-amplifier or to the receiver if a pre-amplifier is not used. Overloading, exceeding the maximum allowed input levels, to the system's pre-amplifier or receiver input levels can result in creating intermodulation products within these devices and may result in inaccurate measurement results. The I-F filtering selection will primarily determine the "signal-to-noise ratio" within the receiver itself. 14 The overall system sensitivity will thus be dependent on the noise figure of the selected receiver, the noise figure and gain of the preamplifier (if used), the system cabling losses, and the gains of the selected antennas. For high-gain systems, used for measuring low signal levels, extreme caution should be taken to ensure that the combination of the antenna gains and amplifier gains will not produce signal levels that exceed the maximum input levels allowed for the selected receiver. Again, because of the importance, saturating an amplifier or a receiver's input stage may create intermodulation products and may result in inaccurate measurements. REFERENCES Brench, C.E., "Antenna Differences and Their Influences on Radiated Emission Measurements," Paper presented at the 1990 IEEE Interference Symposium on EMC. Duff, W.G A handbook on mobile communications. Don White Consultants, Inc. Hewlett Packard. Spectrum Analyzer Series. Application Note Kraus, J.D Antennas, 2nd ed. New York: MGraw Hill. Nahan, N.S., Kanda, M., Larsen, E.B., Crawford, M.L., Methodology for standard electromagnetic field measurements. IEEE transactions on instrumentation and measurement. IM-34, No. 4 (December) Society of Automobile Engineers EMC antennas and antenna factors: how to use them. Aerospace Information Report (January). Filter, Attenuator, Preamplifier, Preselector. --- or Barefoot? Automated Meter Reading Frequently Asked Questions. What is AMR? Chapter 11 Waves & Sound 11.2 Periodic Waves In the drawing, one cycle is shaded in color. The amplitude A is the maximum excursion of a particle of the medium from the particles undisturbed position. Coaxial Cable Delay By: Jacques Audet VE2AZX ve2azx@amsat.org Introduction Last month, I reported the results of measurements on a number of coaxial cables with the VNA (Vector Network Analyzer). (Ref.